Hammocks are great things to invest in, especially when you have a kid. Not only are they one of the most comfortable things to sit in, but they’re also extremely fun and can help your child love the outdoors more. One of the greatest things about hammocks is that you can easily take them with you anywhere you go. You can keep them in your garden or backyard, you can take them camping, you can bring them with you when you’re going to the park, and so on. When choosing a kids hammock, there are certain things you have to keep in mind. We’re going to tell you what they are, and we’re also going to provide you with 4 kids hammock options that you should check out. Keep reading for our top choices, or you can view the best sellers on Amazon. Location is really important when it comes to purchasing a kids hammock. For instance, you have to consider how much space you have available for this purpose. That’s because hammocks come in different shapes and sizes. Also, keep in mind that whenever you hang a hammock, you have to consider the fact that you want to protect your children from any danger. Which means you shouldn’t hang it too high. Children are naturally full of energy, and if they roll in the hammock, they might fall. While you can’t entirely prevent that, you can make sure you at least buy a hammock that you can hang quite low. As we’ve already established, there are many types of hammocks out there. Some of them focus more on making your stay in them comfortable, while others are designed to look good. Which is why before purchasing one, you have to think about what your priorities are. Do you want your child to have a comfortable place to sleep in outside? Or would you prefer the hammock to be nice and colorful, and serve as a cool playing area? How strong and sturdy do you want the hammock to be? That way, it can last you for a long time. Usually, a hammock can hold a weight of between 150 and 500 lbs. While the weight of your child shouldn’t be a problem for the typical hammock, you also have to take into account that most children won’t simply sit still in their hammock. They’re most likely going to jump around. The thing you must remember is that the weight capacity you can find on the hammock’s label refers to what is known as static weight. The jumping doesn’t fit it that category, so it might make the hammock break faster. If you have multiple kids that are going to share the hammock you are going to need to get one with a higher weight rating. The weight of the hammock is important whenever you want to take it with you when you go on a trip. If you’re interested in hammocks that you can easily move around, consider some lighter ones (there are hammocks that only weight 7 ounces). If once you install the hammock in your backyard or garden, you know you’ll never move it to some other place, you can go with a heavier option. All hammocks require you to install a suspension system as well. The thing is, not all of them come with the suspension system and the carabiners that you need. Before buying a kids hammock, check whether or not the package also contains these items. If it doesn’t, you’re going to have to purchase them separately. Keep in mind that there are multiple types of suspension systems. You can choose between webbing straps, nylon ropes, or synthetic tree slings. The more attachment points the hammock has, the more flexible and adjustable it will be. Do you live in a place where the summer days and nights are quite warm? Then you’re going to want to keep your child as comfortable as possible when he or she is in the hammock. Most hammocks are effective for this purpose since they’re made of a type of nylon that is extremely breathable. There are cotton hammocks out there as well, but we would recommend you to only use those inside the house. 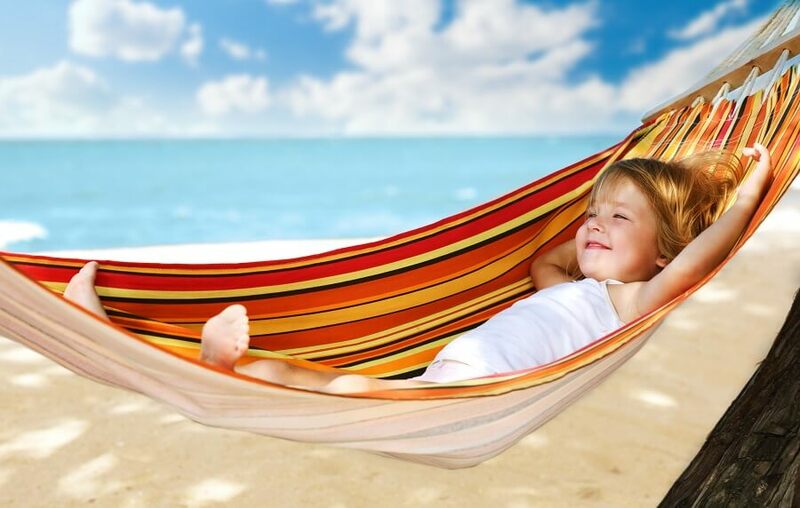 If you want to provide your child with some extra warmth while in the hammock, you can look for sleeping pads or underquilts that can insulate the kid’s hammock and make it more comfortable. The last thing we want to touch upon when it comes to choosing the perfect kids hammock are the extra features you can get. For instance, if you want to use the hammock when you go camping, you might want to consider one that comes with a weatherproof tarp. This will ensure that if it rains, your kid can still lie in the hammock without getting soaking wet. Another cool extra feature is bug protection. Here, you have several options to choose from. One would be a bug net that you’ll have to buy separately. Another one is buying a hammock that has been permethrin-treated. Finally, you can also purchase a kids hammock with integral 360 degrees screens. 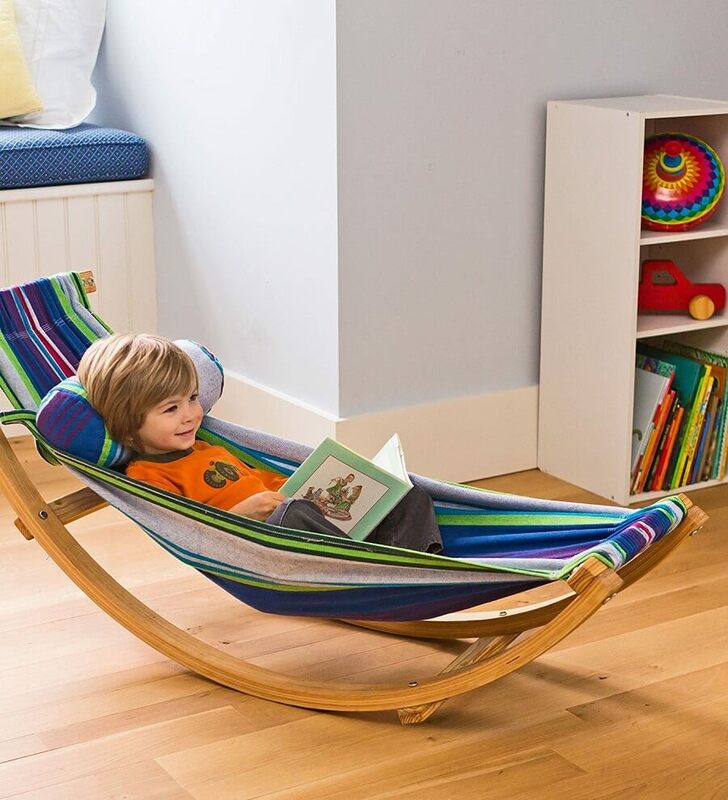 This kids hammock is great for people who want to be able to install theirs both indoors and outdoors, creating a fun and comfortable sitting area for their children. The length of the hammock is 59 inches and the diameter of the seat cushion is 27.5 inches. It can hold up to 176 lbs, so it’s quite safe and reliable. Your kid can use it for many types of activities. For instance, you can encourage him or her to go outside in the hammock to read or listen to music instead of doing it inside. Plus, there’s enough room in it for children to be able to play there too, which is a great added benefit. 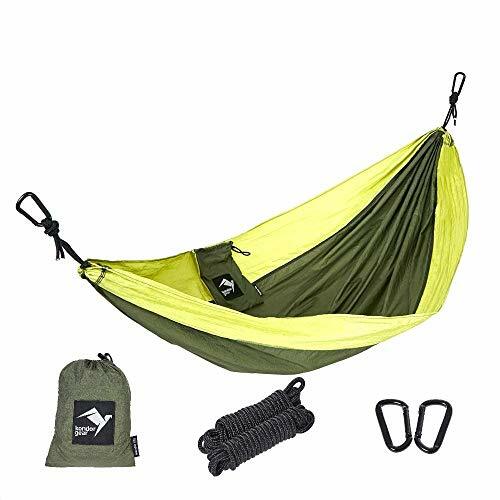 If you purchase the hammock you also get a nylon rope, a cloth case, a mounting bracket, a hook, and bolts. Basically, the package contains everything you need to install the hammock. You can choose blue, green, pink, and light pink. You can check the price and reviews now. Remember when we mentioned hammocks designed to look amazing? Well, this is definitely one of those. It comes in all the colors of the rainbow, to make your child’s sitting experience a fun one. It can hold up to 175 lbs and it’s suitable for children ages 3 and older. 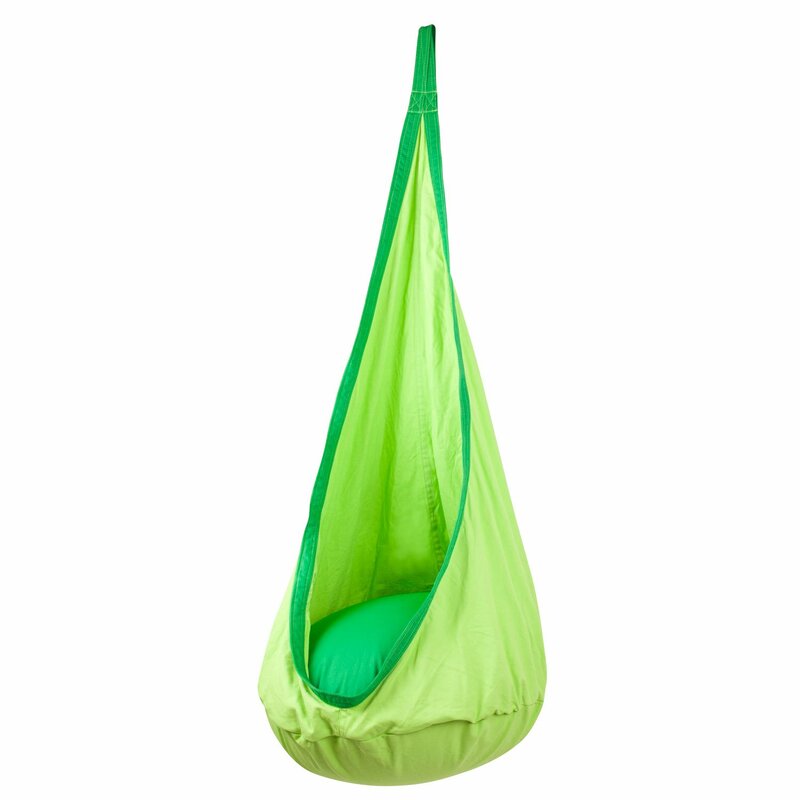 Despite being a kids hammock that focuses on design, it’s also high-quality and comfortable. It’s made of cotton, which means it’s extremely soft, strong, and lint-free. 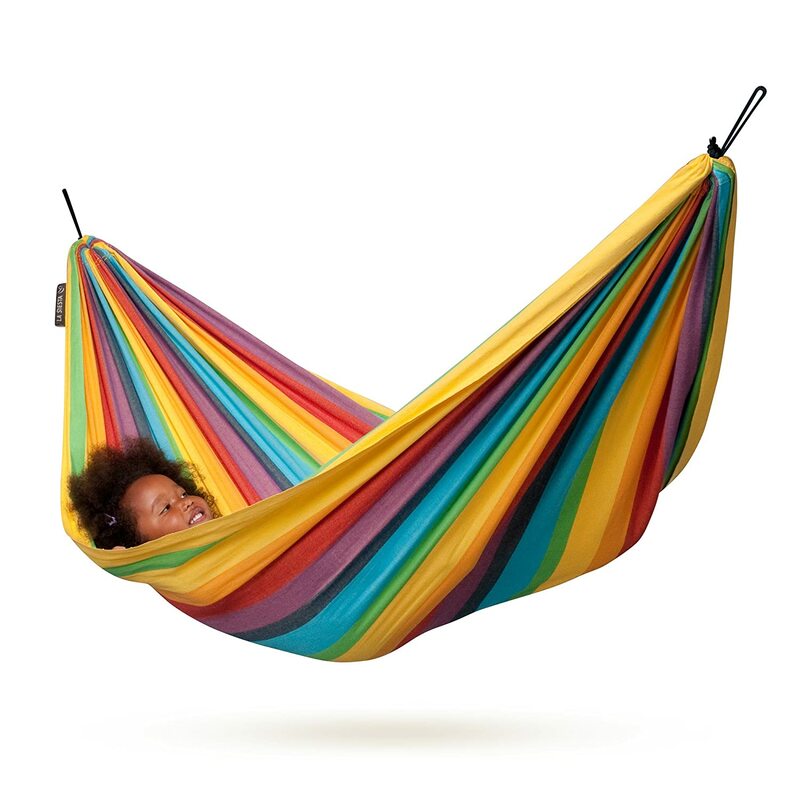 You can use this hammock both indoors and outdoors, and you even get a closed suspension. This ensures your child will be 100 percent safe while in it. If you want to buy it, you can do that on Amazon as well. A more sophisticated hammock, this one is more of a kids hammock chair than a traditional hammock. The great thing about it is that the stand rocks back and forth, but the actual hammock doesn’t. So your child can sit in it and read, or he/she can sleep there comfortably without getting disturbed by the constant motion. Even though this hammock might look heavier than others, it actually isn’t that heavy. This means that you can move it around easily, and place it both outdoors and indoors. 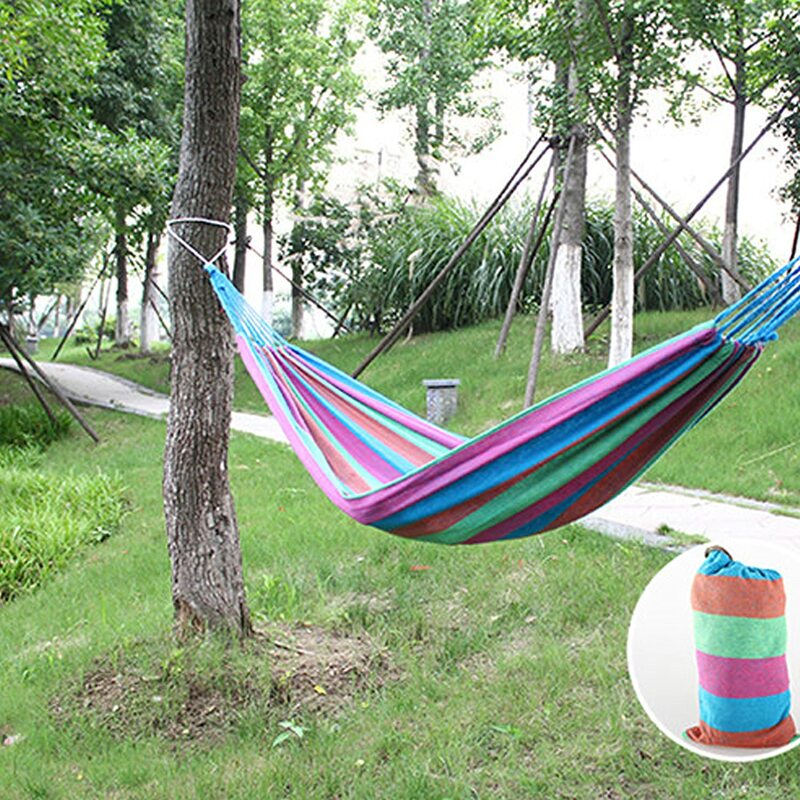 The colorful hammock cloth is definitely one of the main attractions of this hammock. So is the pillow that makes sitting in it a much more comfortable experience. You can read reviews here. Another colorful kids rocking hammock, this one is extremely lightweight, which makes it perfect for camping. Plus, it’s made out of soft cotton, which makes it both comfortable and sturdy. It’s extremely easy to assemble as well, and when you disassemble it, all you have to do is place it in the storage bag that you get with it, and you’re good to go. This kids hammock can hold up to 150lbs. You can read reviews on Amazon. Whether you want to provide your child with a fun and safe space to play in, read books, relax, take a nap in the backyard, or you want to be able to take him/her camping and you need something that can make the trip more interesting, purchasing a kids hammock is a great idea. Most of them are rather cheap, they look nice, they’re sturdy, and they’re comfortable. This is basically everything you could possibly look for in a hammock. 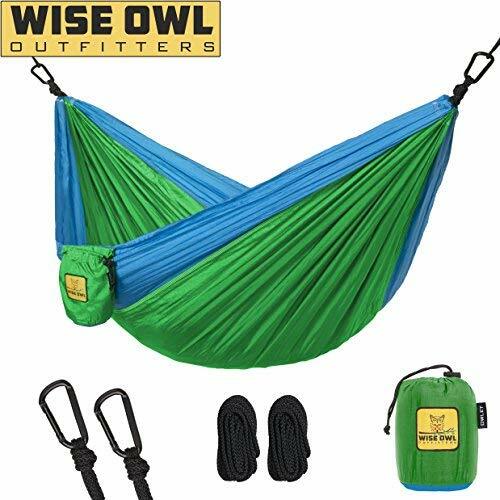 We hope today’s guide has taught you how to choose the best possible kids hammock, as well as provided you with some cool options. Here are some of the other best sellers. 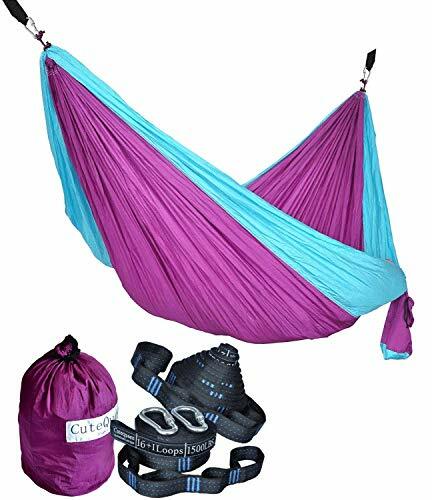 Now that you have a hammock for your kids, make sure to check out our Top 10 Camping Hammocks to find one for yourself.